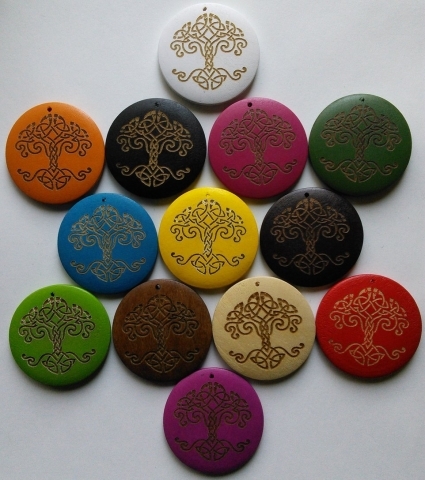 We offer laser etching on any of our products - from tags and scales to rings and business cards. We also offer custom laser engraving! If you have words or an image (like your logo) you want etched please see the custom products listed here and on the other laser etched product pages. If the product you want is not listed please just email us - we'll be happy to quote. We have 2 lasers - the specs follow. This is our primary laser. It is a top of the line, German made, very expensive and very reliable machine that is optimal for most of the engraving we do. Fiber lasers are ideally suited for metal engraving and watt for watt are more than 100 times more effective at engraving metal than a cheaper CO2 laser. no moving parts and a 100,000 hour life solid state diode laser. This means this laser will be up and running when you need it. incredible precision - this laser can make detail smaller than your eye can see! high contrast marking on ANY metal - if its metal we can engrave it. It can also mark some plastics, ceramics and some stone. no moving parts means we can only engrave within a 5"x 5" engraving area. We can engrave large pieces - just 5"x5" at a time and re-aligning is an issue for large images. There is a lens available that allows up to a 12"x12" work area - should it be required we can invest in this. Our first laser is a low end Chinese CO2 laser with US software and support. Its not so reliable (read may be down from time to time) but it has its uses. This is the laser that most other companies selling etches scales will have. The resolution and quality of the etch on metal is definitely not as good as the fiber laser. in theory this laser can engrave anodized aluminum but the quality is much better on the fiber laser. Ideally we are looking for high resolution line drawings in one color. The format does not matter. For example the blue flower image here is a perfect image for engraving at any size. (Click to see its original size) This image has a nice generous size and clean sharp edges of all lines. Print out your artwork on paper at the same size that it will appear on the item you want engraved - a picture thats looks ok at 6" on your screen may not look so good at 1" becauce your eyes can't see the detail. if you want to draw your artwork by hand use high quality fine tip markers to get a clean solid line - soft pencil lines will not work well. If you send us vectors they should be clean vectors with no hidden lines. The laser will find and engrave all hidden lines. Price ranges from 28.50 cents US to 38.00 cents US each. This type of design is availble with bulk discounts on large scales $200/1000 scales for any non precise design on large scales - we can use our robot to engrave! Price ranges from 30.00 cents US to 40.00 cents US each. Price ranges from 26.20 cents US to 35.00 cents US each. Price ranges from 26.25 cents US to 35.00 cents US each. 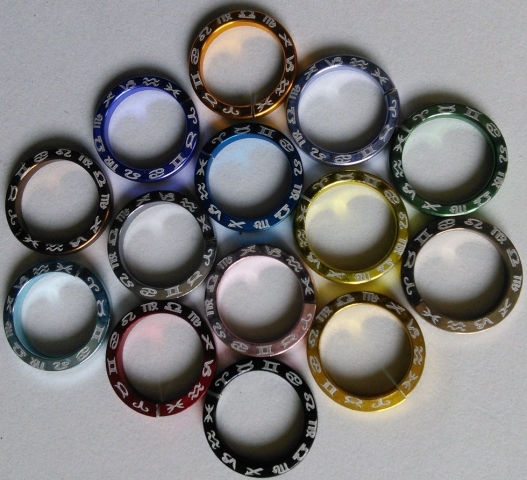 2 of each of black, mirror, mirror gold, glow in the dark polycarbonate and clear polycarbonate. Scale is etched on convex side. Forged in dragon flame, these small anodized aluminum scales are etched with a scale pattern from the dragons fury. The etching is on the convex side of the scale. Each package contains 10 scales. No dragons were harmed in the making of these scales. Special Notes: 2 of each of red, purple, yellow, green and blue. Great for making dragons, fairies, butterflies, and angels! 5 sets of 2 wings per bag. They are etched opposite so they are for the left or right side. The laser etching shows white on the anodizing - which means its bold on dark scales and subtle on light scales. Special Notes: Base price is 25 cents more than the other scales (starting at $3.75). The price difference is automatic when it is added to your cart! Price ranges from 28.8cents US to 38.5cents US each. Special Notes: Base price is 35 cents more than the other scales (starting at $3.75). Turn your fairies into demons! Or make great Dragons!5 sets of 2 wings per bag. They are etched opposite so they are for the left or right side. Scales are anodized aluminum unless otherwise noted. These are etched using 2 damascus patterns to give a more realistic damascus feel when used together. Each package may contain both patterns in the colors listed for a total of 10 scales - we do not guarantee each color will have the same nor different patterning. Price ranges from 27.00 cents US to 36.00 cents US each. Special Notes: 2 of each of blue, green, purple, red, orange. Special Notes: 2 of each of brown, gold, champagne, frost and sand. Brown and sand are not anodized on inside (concave side) of scale. Price ranges from 38.40 cents US to 51.50 cents US each. These are etched using 1 damascus pattern. Please Note: All anodized titanium scales have imperfect color on the back side. There is a round mark of no color. You can see this by clicking the pics to see the larger image. Price ranges from 28.80 cents US to 38.50 cents US each. Special Notes: BRIGHT anodized aluminum. These are made using SHINY material! The edges are not colored and concave side is matte but same color. Special Notes: 2 of each of black, bronze, brushed gold, champagne and frost. Price ranges from 30.70 cents US to 41.00 cents US each. Price ranges from 50.00 cents US to 67.00 cents US each. Price ranges from 55.80 cents US to 74.50 cents US each. Special Notes: This blend contains light blue, darker blue, blue/purple, violet and teal. The blues can look very simliar when mixed. All Ti colors are blends - do not expect solid colors on each scale. Special Notes: Each scale has a blend of colors on it. Scales are similar in color but unique. current batch is not like the picture - it’s a blend of blue, gold and dark rose. Special Notes: This blend contains a random mix of colors. Some of the scales may not even be colors available in other mixes or alone - these ones are unique and not repeatable in a lot of cases. All Ti colors are blends - do not expect solid colors on each scale. This blend changes from bag to bag - do not expect the scales to match. DO NOT expect exactly what is pictured - this is an example! Special Notes: This blend contains bronze, gold, rose gold, dark rose and rainbow. Rainbow has warm and cool tones. This laser pattern is taken from an actual dragonfly wing! Great for making dragonflies, dragons, fairies, butterflies, and angels! 5 sets of 2 wings per bag. They are etched opposite so they are for the left or right side. Forged in the intense heat of a Phoenix rebirth, these anodized aluminum scales are etched with a feather pattern. No Phoenix were harmed in the making of these scales. Special Notes: Made by inverting the laser pattern on a black scale. White front is matte, back is black. Special Notes: Beautiful gold/bronze etching on stainless scales. The back side is stainless colored and does not match. Get a little wild with these anodized aluminum scales etched with a zebra pattern. Please note: We will add more colors or materials based on popularity. If you would like these in another color please contact us. Forged in dragon flame, these anodized aluminum scales are etched with a scale pattern from the dragons fury. Price ranges from 23.1cents US to 31cents US each. Price ranges from 31.60 cents US to 42.50 cents US each. Price ranges from 34.60 cents US to 46.50 cents US each. Special Notes: These are real bronze - not an anodized color. The engraving is a dark brown color. Price ranges from 29.60 cents US to 39.50 cents US each. Scale is etched on concave side. Etched on the concave side. (inside curve) Each package contains 10 scales. Special Notes: The backside of these scales is the mirror side. The etched side is not as shiny. You will receive 10 scales - every scale will be unique and have the beautiful color variation of titanium. You cannot specify color preference - we can only offer blends as described. Price ranges from 57.60 cents US to 77.00 cents US each. Special Notes: Pheonix feather pattern is etched on convex side of scale. Each scale is then anodized in a blending color from purples thru gold to touch on pale blue. Variation is expected. The anodizing is only on 1 side the convex side. The concave side is partialled colored and has a circle that is not colored. Look at the large image to see this. Special Notes: Each scale is laser abalated to give it a clean smooth finish. Then it is anodized in a blending color from purples thru gold to touch on pale blue. Variation is expected. The anodizing is only on 1 side the convex side. The concave side is partialled colored and has a circle that is not colored. Special Notes: Each scale is laser abalated to give it a clean smooth finish. Then it is anodized - the anodizing can vary in this mix from crazy lines to solid colors not in other mixes. There is a lot of variation in this mix. 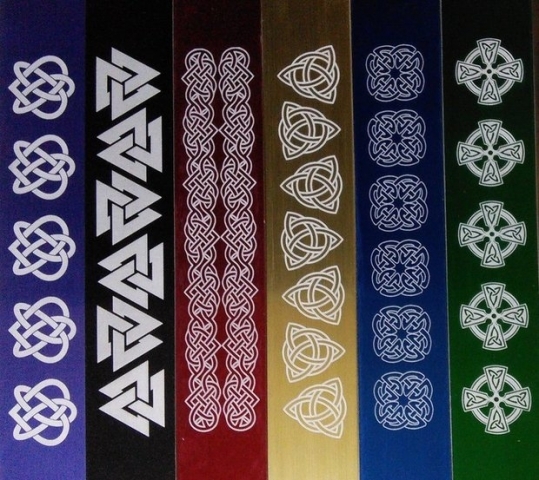 Special Notes: Colors include 2 of each of purple, bronze, gold, light blue and dark blue. Each scale is laser abalated to give it a clean smooth finish. Then it is anodized. Variation is expected. 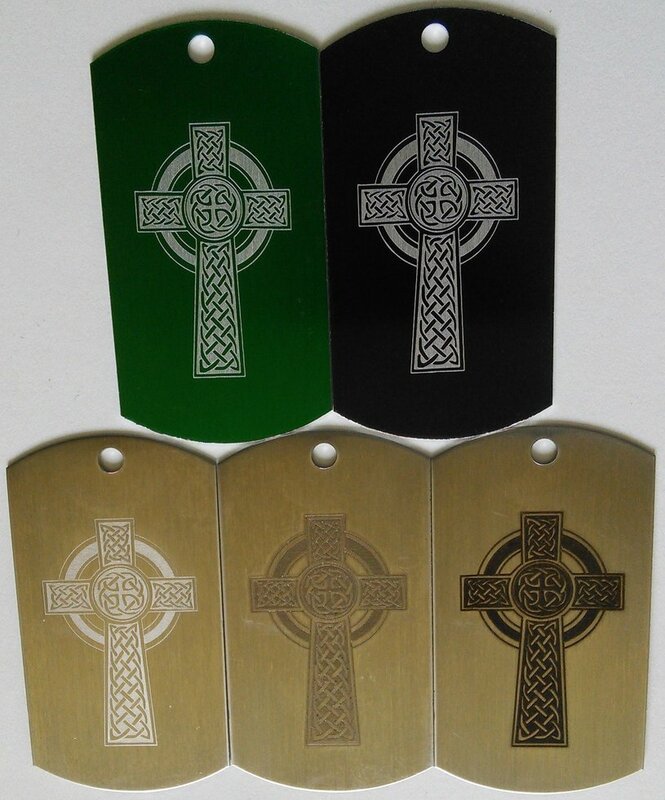 yes we can take custom orders for your image on any of these materials or anything else we sell that can be engraved. custom designs available at no extra charge with a 100 piece min. custom designs at no extra charge for 50 or more. Please note these are shipped as cut and will need polishing. See large image for unpolished. A wire brush in a dremel works great.